A goal from former Rugby Town youth teamer Jetmir Esso was a deserved consolation for Daventry Town in Saturday’s 3-1 Evo-Stik Northern Premier League defeat at Basford United. Basford United went into the Division One South clash knowing that a victory would secure them a place in the play-offs. Meanwhile, Daventry welcomed back keeper Ben Heath and skipper Ricky Hill following the midweek derby defeat at Rugby Town. Basford included former Nottingham Forest, Rotherham United and Crewe striker Eugen Bopp in their starting line-up and former Daventry Town midfielder Stuart Hendrie. United took the lead from the penalty spot in the 16th minute after former Carlton Town striker Ruben Wiggins-Thomas was judged to have been bought down in the area. Last season’s leading scorer took the kick himself calmly stroking the ball past Heath. Heath made a number of impressive saves preventing United from going further ahead until a couple of minutes into the second half. Hendrie provided the assist for Wiggins-Thomas to score his second goal from a couple of yards out. 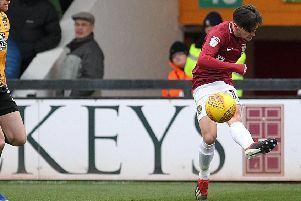 Wiggins-Thomas was once again involved in United’s third goal, rounding Heath before knocking the ball back to Kyle Dixon who tapped the ball into the empty net to put the game beyond Daventry. The impressive Esso scored a consolation goal in the 86th minute and Daventry continued to press the play-off contenders with several good efforts. Panzo-Antonio hit a free-kick which skimmed the bar and Garth Mzungwana had a shot turned around the post by keeper Saul Deeney. On Saturday, Daventry entertain Gresley and three days later Belper Town visit Communications Park.